Will the eclectic 'Dil Dhadkne Do' charm the film-goers? Finds Ganesha. After treating us to a splendid, sublime movie experience in the movie Zindagi Na Milegi Dobara in 2011, famed film director Zoya Akhtar is back with a bang with another ensemble cast entertainer – Dil Dhadkne Do. Her movie has already grabbed a lot of attention, and is one of the most awaited films of 2015. The genre of the movie is said to be that of Comedy-Drama. Featuring Anil Kapoor, Shefali Shah, Priyanka Chopra, Ranveer Singh, Anushka Sharma and Farhan Akhtar in key roles, the movie presents a story about a dysfunctional Punjabi family who is on a cruise trip. Known to have been initially based on the real life brother-sister relationship of Farhan Akhtar and Zoya Akhtar, the story of the film Dil Dhadkne Do will revolve around the pivotal characters' sometimes complex sometimes comic relationships. Ranveer Singh and Priyanka Chopra play the reel-life brother-sister in this movie. Shot on a Cruise Liner Deck-7 in scenic, exotic locations throughout Europe, mainly in France, Spain, Tunisia, Italy with some important parts even in Turkey, the movie, apart from its supposedly power-packed performances and great songs, also promises a visual delight to the audiences! Ganesha notes that the film 'Dil Dhadakne Do' is releasing with the Cancer Ascendant. The planets Venus and Jupiter are placed in the Ascendant House in the film's Release Time Chart. The Lord of the Ascendant Moon is placed in 6th House in the Release Time Chart. 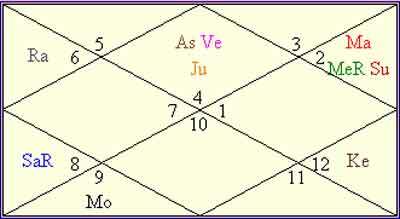 It is noteworthy that the malefic Ketu is placed in the 9th House of this Release Time Chart. Mars, the 10th House of Success' Lord is placed in the 11th House of Gains with Sun, the Lord of the House of finance. Ganesha notes that film is likely to enjoy a good start at box office, as both Jupiter and Venus, positive planets, are placed in the Ascendant House. As the Lord of 10th House of Success Mars is placed in the 11th House of Gains with the Lord of the 2nd House of finances, the Sun, the film should receive a good response from its viewers, as expected. It may receive acclaim, and people may appreciate the actors' performances. However, Ganesha feels that overall 'Dil Dhadakne Do' is going to do average business, in the following two weeks and also during the month. This film, tough, will perform well in the overseas territory, because the 12th House Lord Mercury is placed in the House of gains, and the Lord of 9th House is also exalted in the Release Time Chart. As the Lord of the 5th House of performance Mars is placed in the House of gains, creative prowess of the film shall receive acclaim. As aforementioned, the performances of the lead actress and actors will be highly appreciated. As Venus is placed in Cancer Sign with the Lord of Fortune Jupiter, it is also likely that the female lead character's performance will be highly appreciated. Music, Screen play, choreography and cinematography will be highly appreciated. However, Ketu's adverse placement in the 9th House of the Release Time Chart indicates that the film's overall business may not be very great, and thus the film may not classify as a big box office hit.